B&W T7 is company's first portable Bluetooth speaker | What Hi-Fi? B&W has entered new territory with the launch of the T7 portable Bluetooth speaker. 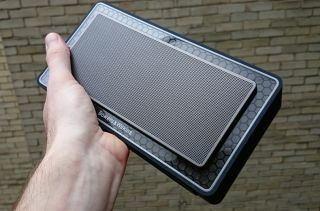 It's the first portable wireless speaker from Bowers & Wilkins and the first to come equipped with Bluetooth technology. Following in the footsteps of B&W wireless AirPlay speakers such as the A5 and the A7, the B&W T7 is the first speaker to support Bluetooth and therefore Android devices - as well as Apple phones and tablets, computers and other Bluetooth devices. The B&W T7 has a retail price of £300, pitting it against the likes of the Bose SoundLink (£260), Geneva Model S Wireless DAB+ (£330) and Monitor Audio S200 (£200), plus multiroom-capable speakers such as the Samsung S5 (£230) and Sonos Play:5 (£349). The T7 supports the superior aptX Bluetooth codec, while there's also a 3.5mm auxiliary input for making a wired connection. A power jack and a USB service input for software updates are the other connections. The speaker just under 12cm tall and around 21cm wide. It has a 4cm wide footprint but, due to the design which sees the speakers protrude slightly, it's around 5cm deep in total. It weighs 950g, so is a comfortable weight to move around your house and take outside. Most notable about the design is the 'Micro Matrix' honeycomb-like cells, which act as bracing for the cabinet and aim to help reduce resonance and coloration. Borrowed from the Matrix bracing used in larger speakers such as the 800 Series, this new, smaller design was actually first seen on a Jaguar CX-F concept vehicle that B&W worked on. Now Micro Matrix has found its way inside the T7 speaker and it cetainly helps to make an eye-catching design, the transparent border to the speaker helping to make the unit blend in to its surroundings. Two specially designed 50mm glass fibre drivers are inside, each made from the same material as used on the company's other wireless music systems, while two auxilliary bass radiators (ABR) help to add the necessary bass. The internal electronics and DAC are the same as the other B&W wireless music systems on the market, with the T7 speaker using two 12-watt filterless class D amplifiers. Portability is a key selling-point for the T7 and B&W claims the battery is good for around 18 hours. B&W told What Hi-Fi? in an advance briefing that this figure was based on a conservative estimate of relatively demanding usage - 75% volume and rock music - whereas at lower volume or for talk radio the T7 should last much longer. A power pack is supplied for mains power and charging. The main bulk of the controls are likely to be handled by your streaming source, be that a phone, tablet or computer, but there are also soft buttons on the top of the device for pairing devices, play/pause and adjusting the volume. You can also skip tracks with a double-press. You can pair up to eight different devices at one time - adding more will simply bump one connected device off the list - while one 'main device' can be set to connect automatically as soon as it's in range. Naturally, B&W is bullish about the sound quality. The T7 was initially voiced in the same room as its high-end speakers found in the likes of Abbey Road Studios, before fine tuning took place in a range of more real world environments. The B&W T7 is on sale now on the B&W online store and should be in stores very soon, priced at £300. You can read our B&W T7 hands-on review online now.